Almost nothing is quite as satisfying as biting into an incredible burger hot from the grill! Loaded or simply dressed, burgers are an iconic American staple in both backyards and restaurants. 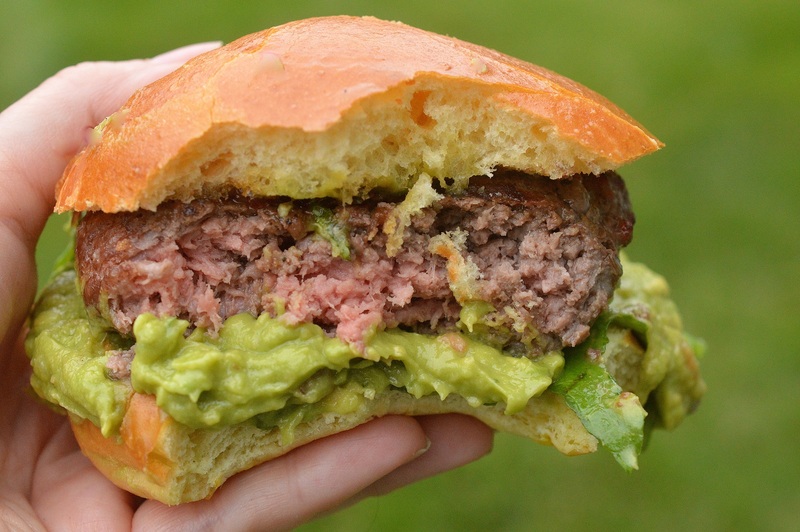 These easy to prepare Guacamole Burgers are a fresh take on the traditional, give them a try. I decided to combine a few of my favorite things into one delicious burger! I made some fresh guacamole and for an amazing kick, I basted the burgers with hot pepper jelly and added a little extra when assembling them. Geez!! Was this ever a delicious burger! If dairy is a concern, you never realize you are missing cheese with these Guacamole Burgers since the creaminess of the guac stands in its place. 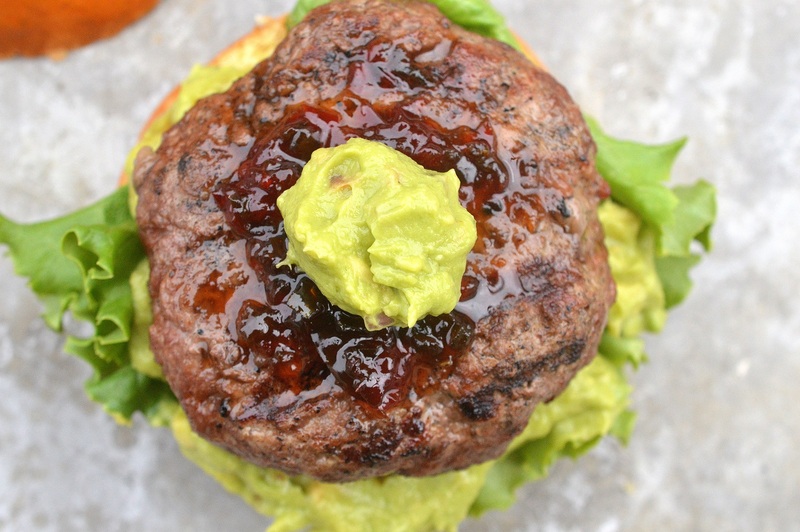 The creamy guac, the smoky, juicy burger and the sweet & spicy kick of the hot pepper jelly all play off of one another so well! I only have one regret…Bacon! Why on earth didn’t I think to add bacon to these burgers??? They honestly didn’t need bacon but hey…BACON!! Why the heck not? My son and husband were bonkers for these Guacamole Burgers and my daughter (who doesn’t eat beef or pork due to allergies) ate guac and chips until her heart and her stomach were happy! Guacamole is SO easy to make, it’s good for and it tastes great too!All you need are ripe avocados, fresh lime juice, Kosher salt, minced jalapeno, fresh garlic. From there you can choose to add cilantro (if you hate cilantro, like my husband, add in fresh basil leaves instead…it give a fresh taste) a bit of onion (I don’t), some chopped tomatoes and if you like it spicy, red pepper for more of a kick. It literally takes minutes to make guac, I say make extra and serve chips and guac too! However, if that’s not your thing, store-bought guac will work as well. I’ve made guac plain (we like it spicy), with pomegranate seeds, with bacon (yes BACON!!! ), with fruit and even with lobster. There really are no rules, just make it however you like and make it often! As far as burgers go, sure some people add this, that or the other to their ground meat. Me? I am happy with quality fresh-ground meat, salt & pepper. Sometimes I combine more than one meat together for my burgers, which in my opinion is when they shine the most. I crafted these Guacamole Burgers for my ongoing recipe development relationship with SABER Grills. You can find this recipe as well as so many other delicious grilling recipes on the SABER Grill Website. Oh my goodness! 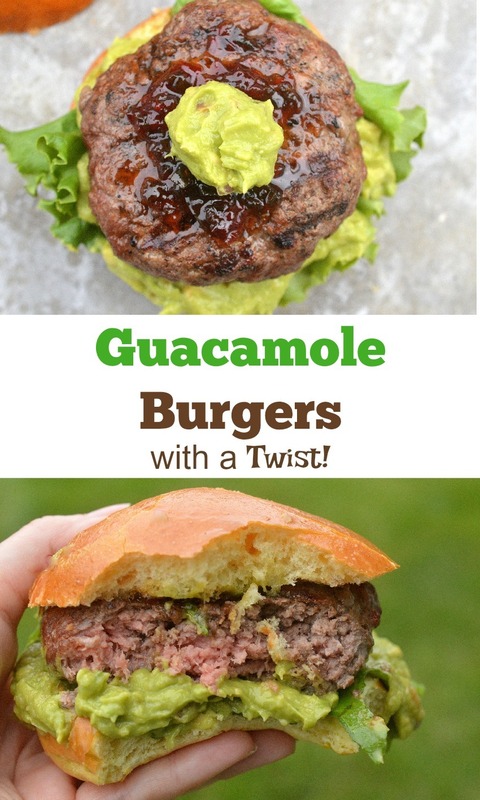 I love everything about this burger, especially the fresh guacamole! Going to check out your link for the recipe.